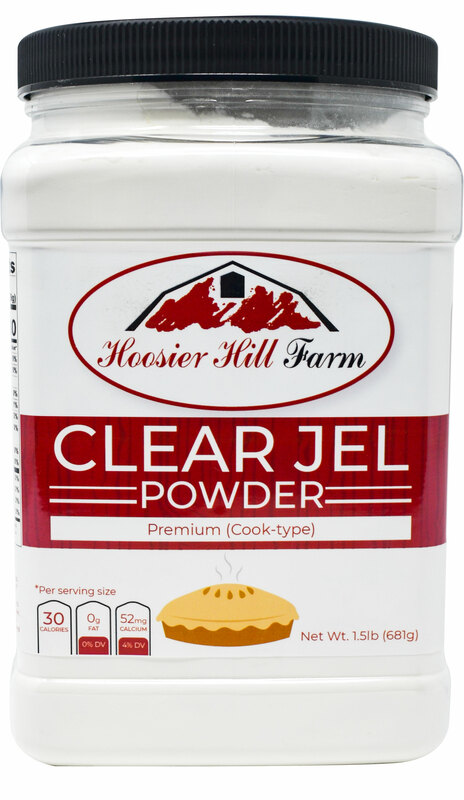 Product reviews: Hoosier Hill Farm Clear Jel (cook-type), 1.5 Lbs. Used it to make apple pie filling prior to canning. I can't wait to try it. Perfect for making pie filling, stews, and anything that you want thickened. I use it for canning as it is safe and I even use it for regular cooking. Advantages: Perfect thickener for your favorite recipe. I bought the cook type clear-jel for canning my apple pie filling. It worked perfectly, I inadvertently ordered the instant clear-jel on the next order and it was chaotic to say the least. Could never get rid of the little pieces of jel that would never dissolve. PLEASE be sure to use the cook style for less stress in canning. I am sure the instant would be good for gravies so for that reason I will give it 3 stars. Great product. My peach piemail filling came out perfectly. This stuff works great...far better than regular cornstarch. I would recommend that you dissolved the ClearJel in water to make a slurry first before adding to your hot fruit mixture, as it will form dry clumps that are next to impossible to stir out if adding just the measured amount dry. Advantages: This stuff works great..
Used to can apple pie filling. It worked great. It worked wonderfully for my apple pie filling that I canned! I found a need for this product when I wanted to can apples for pie filling. I was pleasantly surprised when it worked as advertised - no lumps! Now my mind has been working overtime thinking of more ways to use this in the kitchen. Looking to make great-tasting pie filling....then this is your product. I always wondered how people got their filling to look so appetizing and now I know..it is the clear jel. Advantages: Makes a great pie filling. Worked like a charm in my apple pie filling! Don't know how I would have gotten through canning season without it. Mixes easily and well, no need to mix separately. Great stuff. My mom does a lot of canning, and this worked great for her! Cheap and effective, we got 2 of these, and they should last us at least six hours. (kidding) but yeah, great product, get it! Used for canning apple pie filling, worked great. This is the First time I have ever used this Clear Jel. I purchased it to make canned apple pie filling. This is awesome. I now use it for everything that I cook and want to thicken. Highly recommend this item!!!!! Excellent product. Worth the cost. As expected. Will order again. We used the clear jel to prepare our Apple pie filling and we water-bath canned 2 pecks of apples this year. I resisted the last few years buying the "cook type" jel because it was so hard to source locally. Found this on Hoosier Hill Farm and just bought it after struggling again with canning. Its a huge difference. The instant is great when you're cooking and need it right away. The packaging was great, the container is nice. Would be nice if I could buy a "refill" type bag in order to retain the plastic container when I have to buy more. I'll be buying again! This made my canned apple pie filling look so beautiful. This stuff is awesome. We love it! Tastes better than Kraft.